For the second consecutive offseason, the New York Mets have done it: they have re-signed outfielder Yoenis Cespedes. Multiple outlets are reporting that the Mets and Cespedes have agreed to a four-year deal worth $110 million. 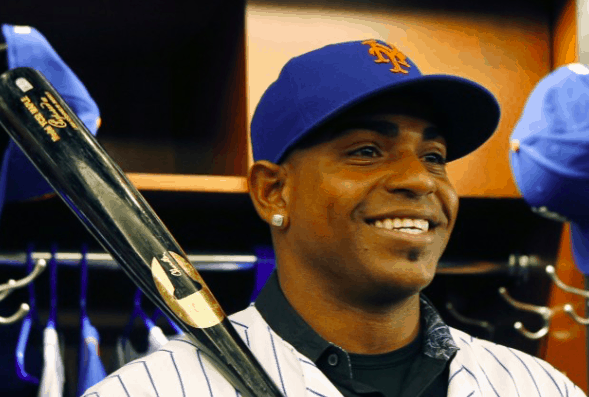 The contract will give Cespedes the highest annual salary among outfielders. The deal also includes a full no-trade clause, keeping Cespedes in New York through the 2020 season. The Mets signed Cespedes to a three-year deal last offseason, even after it seemed like they had come to terms with not retaining him. Cespedes then opted out of that deal following the 2016 season so he could once again explore the free agent market. New York was even less optimistic this time around that Cespedes would be re-signed, especially with the belief that Cespedes may require a five-year offer. However, with the market perhaps not quite was Cespedes was hoping it would be, he and the Mets have agreed to a four-year deal. Of course, Cespedes has spoken all along about his desire to remain with the Mets. Cespedes first came to New York at the trade deadline in 2015. He became an instant fan favorite, as he put together a spectacular two months, leading the Mets to the NL East title and ultimately the National League pennant and a World Series appearance. Cespedes returned to the Mets in 2016, and despite battling a quad issue at times, he hit .280/.354/.530 with 31 home runs and 86 RBIs, once again being New York’s offensive catalyst. With Cespedes back in the fold and second baseman Neil Walker accepting his qualifying offer, the Mets will retain their two most productive hitters from 2016. Cespedes and Walker will rejoin Asdrubal Cabrera, Curtis Granderson, and David Wright (if he’s able to return from a serious neck injury) to form the core of New York’s lineup. The Mets hope that group will help provide enough offense to complement their young and talented starting rotation. Of course, now that the Mets know Cespedes will be back in 2017, they now have a somewhat overcrowded outfield. Cespedes will be penciled in to play left field, leaving Granderson, Jay Bruce, Juan Lagares, Michael Conforto, and Brandon Nimmo to fill the other two outfield spots. At least one of those players is now likely to be traded this winter now that Cespedes’ spot in left field is secure. The Mets acquired Bruce at the trade deadline this year, in part as a safe guard in case Cespedes left in free agency this winter. New York has reportedly had trade discussions about Bruce with other teams, as he is the most likely to be moved. However, the Mets could also consider offers for Granderson or Conforto, although they would prefer to trade Bruce. With Cespedes locked into left field, Conforto will likely be asked to move to right field full time, while Granderson and Lagares may split time in center field. Granderson showed late in 2016 that he’s capable of being a competent defensive center fielder, although the Mets may see if Conforto is a better option. Lagares is likely to be used in a platoon with either Conforto or Granderson and as a late-game defensive replacement, as he provides Gold Glove caliber defense in center field. Regardless of how the Mets end up orchestrating their outfield, the fact that Cespedes is returning to New York with no lingering questions about his future is huge for the Mets. Cespedes is one of the most dynamic offensive players in the game, and his presence changes the look and feel of New York’s lineup. With Cespedes re-signed, the Mets have accomplished their top priority for the offseason and have positioned themselves to once again compete for a division title and a spot in the World Series in 2017.